This new model has just been released and offers the best functions when looking for a high quality whole body vibration plate exercise machine. This latest model will go up to 42 Hz. Very fast, great for efficient workouts. Highly portable, easy to store, take while you travel or on the road. 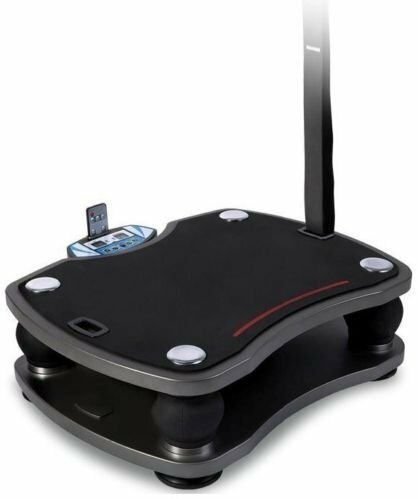 Has a "Soft" and "Strong" mode, to suit users that prefer either soft or strong vibration workouts. Weight: 30lbs, Full 1 year warranty included. NOTE: This item can only be shipped to the LOWER 48 STATES and CAN NOT be shipped to P.O. Box's, APO/FPO, HI, AK, PR. Includes Remote Control and Arm Bands, 500W motor plugs into any standard outlet. Measurements: 22" W x 19" D x 8" H, (Plate Size: 20" x 15"). Vibration Type: Linear Vibration Type Amplitude: 0-2mm (soft model), 3-5mm (strong mode), Frequency 5 Hz to 42 Hz. Maximum Load Weight: 330lbs, Weight: 30lbs, Full 1 year warranty, parts only.